(StatePoint) When cool weather makes you wish for rich hearty meals, let New Zealand be the source of your culinary inspiration. The country’s dishes make for delicious feasting. Think earthy meats like lamb and rich roasted vegetables, paired with juicy medium-bodied red wines. Thanks to the development of six major grape growing regions with breathtaking landscapes, New Zealand has become a top destination for food and wine enthusiasts. While a trip halfway around the world may not be in the cards for you this season, you can bring the classic flavors of New Zealand to your table by starting with a bottle from one of the country’s top wineries. Craggy Range Winery, a family-owned operation, creates New World wines with Old World style. The Te Muna Road Pinot Noir 2014 (SRP $44.99), a medium-bodied selection, is an enjoyable accompaniment at a winter gathering. Its rich red fruit, fine tannins and good acidity creates a savory, dry finish on the palate and pairs nicely with robust flavors. For an appetizing pairing, consider serving Pinot Noir alongside a classic recipe from the Terrôir Restaurant at Craggy Range Winery: Roast lamb shoulder with salsa verde and roasted carrots. 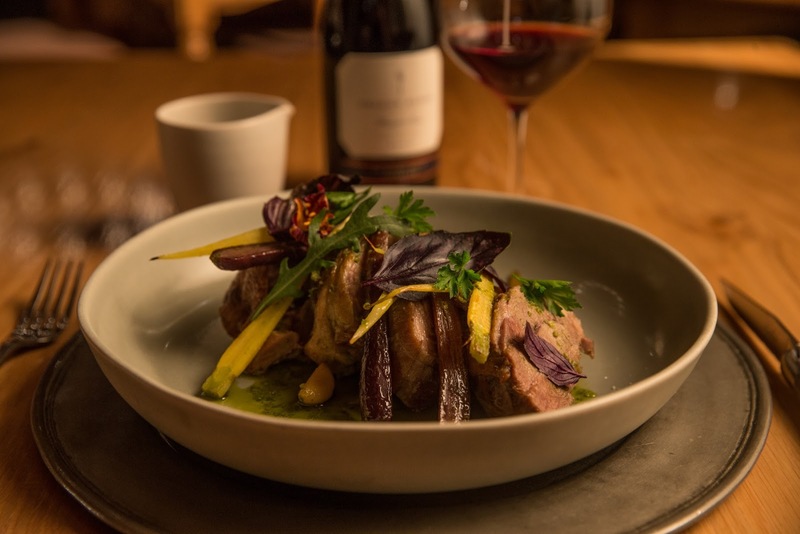 The wine’s bright red fruit will bring out the lamb’s darker, earthier notes for a delicious meal. • 1 boned lamb shoulder, rolled and tied. • 24 hours in advance: Add all the ingredients into a pot. Bring to a simmer at medium heat until all salt has dissolved. Allow brine to cool completely. Place the lamb in the cool brine, cover and leave for 24 hours. Drain the brine and pat dry. • Preheat a large skillet over medium heat for 3 to 5 minutes. Raise the heat to medium-high and add the lamb. Brown the lamb all over then remove from heat. • On a roasting tray, add carrot and onion. Then add 4 cups of hot chicken stock. • Place the lamb on top and then put in the oven to cook for 3 hours. • Remove lamb from the liquid, rest for 25 minutes. In the meantime, strain and skim the stock and reduce by 2/3rds. • For the salsa verde, blitz all ingredients in the food processor until smooth. • Slice the lamb and garnish with roasted baby carrots, salsa verde and some stock. Serve with a glass of Te Muna Road Pinot Noir. No Comment to " Hearty Food and Wine Ideas For Winter Comfort Meals "